Well done to the Under-11 Camogie team who had a great win against Round Towers this morning! Well done to the Under-11 Camogie team who played Leixlip this morning. The girls put in their best display so far this year against possibly the best team they’ve played. After going behind to 2 early goals, the girls then dominated the rest of the first half through some excellent team work and loads of hard work. Thanks to Austin Crowe for the great photographs. Well done to our Under-11 Camogie team who played Naas in very competitive game this afternoon. The girls really enjoying the game and are progressing very well week by week. Well done to our Under-11 Camogie team who played two very good matches against St. Laurence’s today. Keep up the great work. Well done to our two Under-11 Camogie teams who played in the Maynooth blitz this morning and had a very successful outing. Team 1 lost narrowly to Maynooth 1 in their first match, and then beat Celbridge in their 2nd game. Team 2 has two wins against Maynooth 1&2. All the girls played brilliantly and all put in a huge effort. All their hard work is paying off. Training continues tomorrow at 6.30pm and new girls are very welcome. 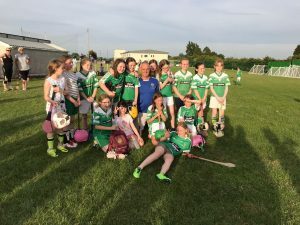 Well done to our Under-11 camogie team who played Round Towers tonight in a 15 aside match. The girls played brilliantly and really enjoyed playing their first full size game, winning 4-02 2-00. Training continues on Monday night at 6.30pm. New players are welcome! The Under-11 Camogie team played Kilcullen’s Under-12s this morning in a very competitive match. The girls played brilliantly in very hot conditions and won by 4 points. A special mention goes to Lillian Rose (Under-8) who played in her first game with the girls and played great. A big thanks to Kilcullen who gave the girls fruit during the breaks and drinks and goodies after the match.